Highly skilled union negotiators have been playing the federal government like a sucker at a high-stakes poker game, using rich contract settlements at government-owned companies as examples for the next round of demands from the government itself. 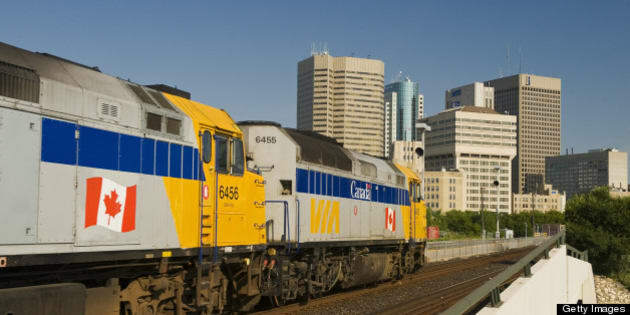 Tempers flared recently in Ottawa when the Harper government tabled new legislation that will give it tighter control over negotiations with unions at crown corporations, such as Canada Post, Via Rail and the CBC. The big-spending bureaucrats have begun to grow accustomed to so-called "interference" from the elected Prime Minister and his caucus. But the high-priced executives who manage government-owned companies have enjoyed, until now, special status: They are paid like business people, with none of the risk. They can provide unpopular products, deliver mediocre customer service, and lose dollars by the billions. But the taxpayer is always there, at the end of the day, to stroke another cheque, cover the losses, and make everything better. The same is true of unionized employees at government-owned companies. They enjoy higher hourly pay than the rest of us. They get sick more often -- or at least they take more paid sick days. They retire earlier, on average, than the rest of us do. The overwhelming majority of them enjoy guaranteed monthly pension benefits, indexed to rise with the cost of living, with additional benefits for their surviving spouse when they pass away. Working for government or a government-owned company is a privileged status that extends into the afterlife. So Ottawa's officialdom considered it rude for Harper and his ministers to use budget legislation to elbow their way into contract negotiations between unions and 47 government-owned companies. Simply put, provisions in Bill C-60, the new budget legislation, grant Harper and his cabinet the power to tell negotiators at these companies how much they can offer unions in wages, benefits and working conditions. The new law even goes so far as to provide a seat at the bargaining table to officials of Treasury Board, the government department responsible for controlling spending. These signs -- that the Harper government is sprouting a spine ahead of next year's big round of contract negotiations -- are meeting stiff resistance. The Globe and Mail reported that "union leaders, academics, and opposition parties reacted strongly" to the budget legislation (after all, who else's opinion matters? ), quoting George Smith, a unionized university professor who previously worked at the CBC, who called it "reprehensible." "There's been no discussion or debate about this and there's no sense that this is what the Canadian public wants," huffed professor Smith. Presumably, Canadians want to pay progressively higher taxes to subsidize money-losing government-owned companies that pay their employees to work fewer days than employees in similar companies not owned by the government. While the rest of us were attempting to dodge becoming one of the 417,000 private-sector job losses during the 2008-2009 financial meltdown, the federal government was actually adding to its payroll and boosting wages and benefits at the same time. Payroll costs grew at a compounded annual rate of 7.1 per cent between 2006 and 2011, from $29 billion to $42.3 billion. According to the Parliamentary Budget Officer (PBO), the average cost of a federal government employee jumped from $86,000 when the Harper government took office in 2006 to $111,379 in 2011. The PBO projects the government's payroll expenses to jump $3 billion over the next two years to a staggering average of $129,800 per employee. Highly skilled union negotiators have been playing the federal government like a sucker at a high-stakes poker game, using rich contract settlements at government-owned companies as examples for the next round of demands from the government itself. It's no wonder they prefer the old way of doing business. Harper's surgical initiative -- to insert some spine into government negotiating teams -- should improve the odds for taxpayers.